Color Club has lots of new collections, and I picked up one from the Foiled Collection and two from the the Backstage Pass Collection. Today I have a look at Hot Like Lava (Foiled Collection) and Fame & Fortune (Backstage Pass Collection) for you! 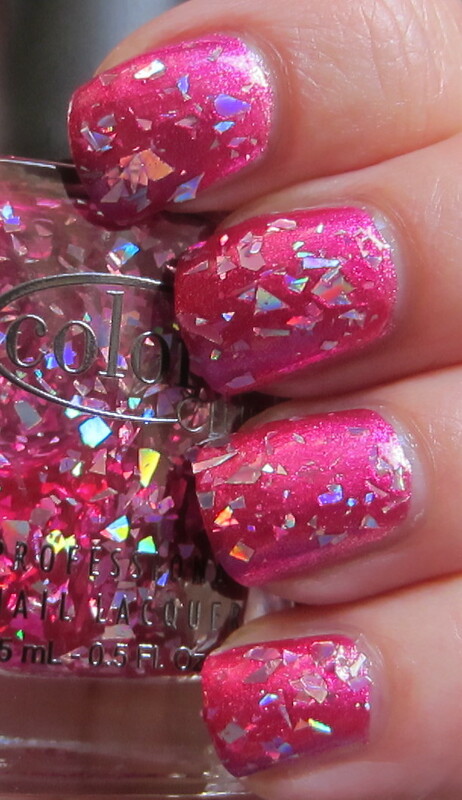 Hot Like Lava is a metallic berry shade sprinkled with silver shimmer. 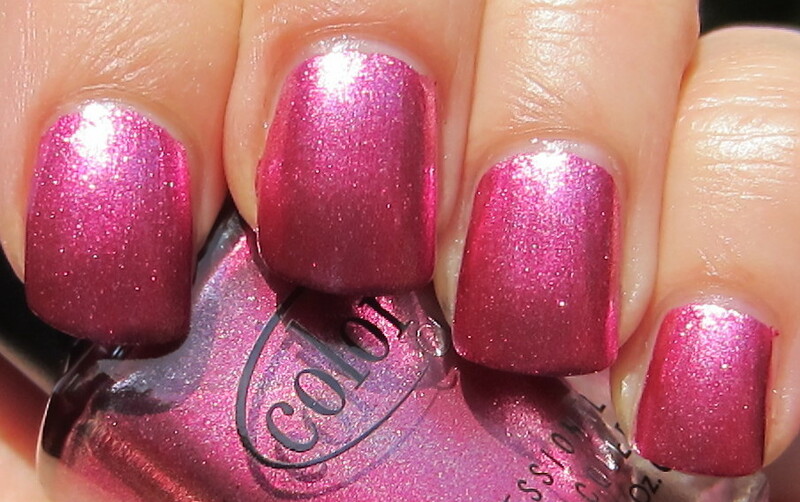 I used two coats on this shade and the formula, while a little on the thick side, applied well. This polish covers without streaks or lines, which is a nice change from a lot other of metallic/foil polishes I've used. It covers so well that my first thought was this would work nicely as a stamping polish. Fame and Fortune. WoW! 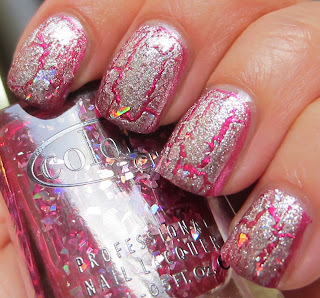 This is one crazy glitter polish! I tried using three coats alone, but I much prefer this one over another polish. Used alone, it actually covers well and has a tinted berry base that builds up nicely. 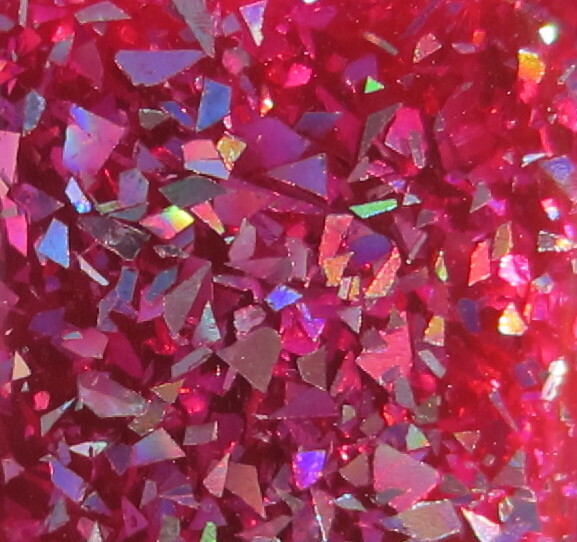 It's filled with multi colored and multi shaped holographic foil glitter, and is shown here using two coats over Hot Like Lava. 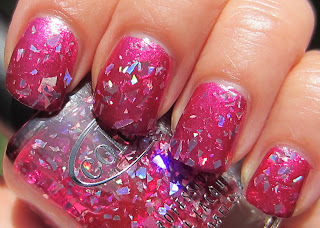 Crazy glitters swimming around in the bottle! As long as I had multiple layers of polish, I thought I'd add one more using Color Club's Broken Tokens. You can still see the glitter peeking out from the cracks, and it seems to light up and glow even in these indoor shots with low light. The foil shade applied very nicely--I wasn't sure if I would like them because those types of finishes can sometimes be streaky and show brush strokes, but not this one. Very nice! Fame & Fortune is one of those polishes that I'm going to play around some more with, because I think it has all kinds of potential. I think I'll layer it over black and then put a coat of glow in the dark polish over it next! This pink is just awesome!!! 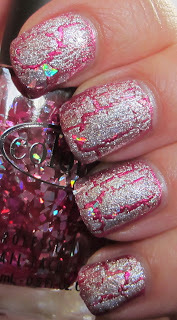 I don't really like it with glitters but then with crackle I do! Now that is some pink!!! I like!! Nice! The glitter one almost reminds me of Covered In Diamonds! now that's an interesting glitter. i wonder what it would look like over black. 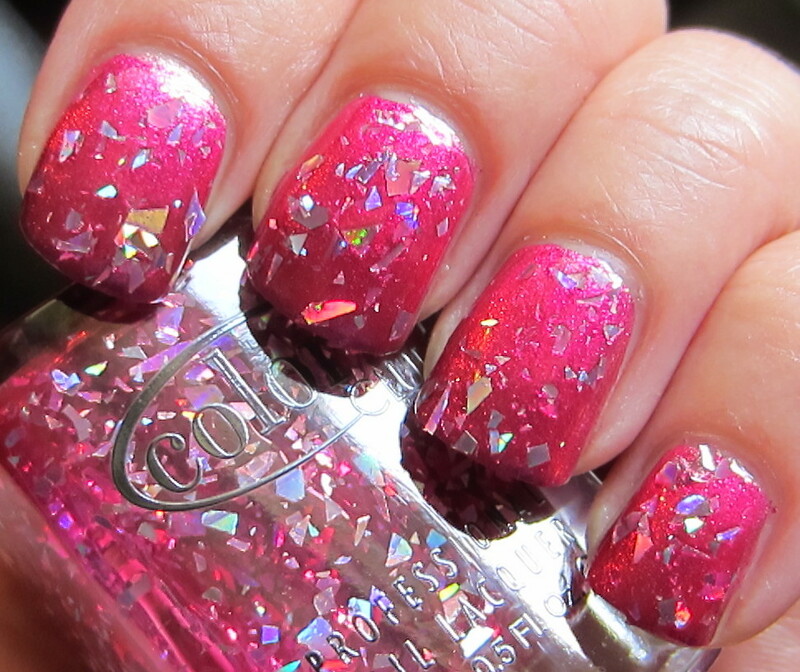 Fame and Fortune is omg gorgeous!!! These swatches are drool worthy! I have to buy those foils. I adore foil polish. That is a pretty one. 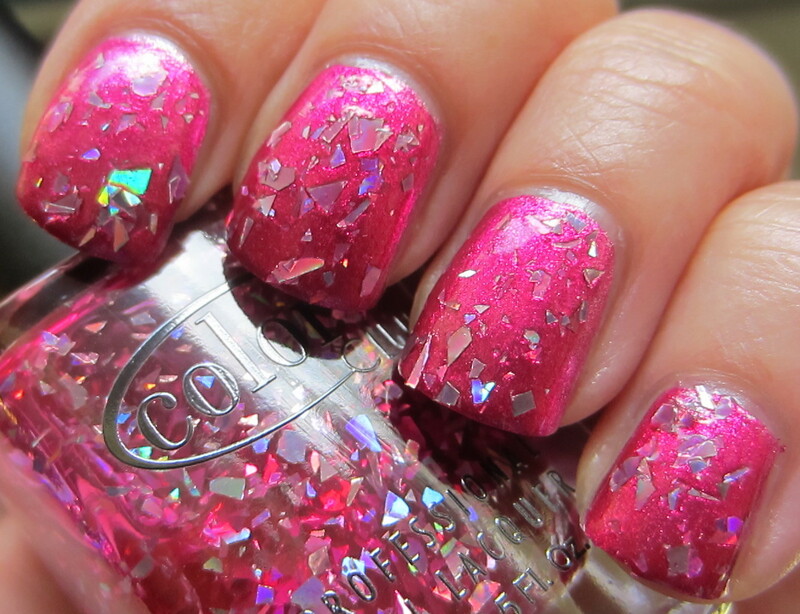 Love that glitter, it's insane! 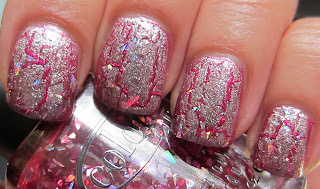 Wow, I really really love that with the crackle over it! Nice! That glitter in Fame & Fortune is really wild! Not sure if I would like it sticking up off the nail bed. I would think it would break off in a day - also probably would eat a clear topper. But i don't have CC available to me - until someone else comes out with it in a brand that is around me - guess I won't get a chance to try it. Fame and fortune is just awesome! Fame and Fortune is crazy awesome! LOVE the close up shot of it! I like that by itself and with the glitter over it. F&F is awesome! I'll have to start stalking my BB&B. Awesome berry pink! The only "pink" I like - it's deep enough.